Brazil’s digital environment is a fertile ground for innovative strategies to spread polarizing content with the intent of manipulating public debate. Caio C. V. Machado is a Brazilian lawyer and researcher at the Computational Propaganda Project at the Oxford Internet Institute. 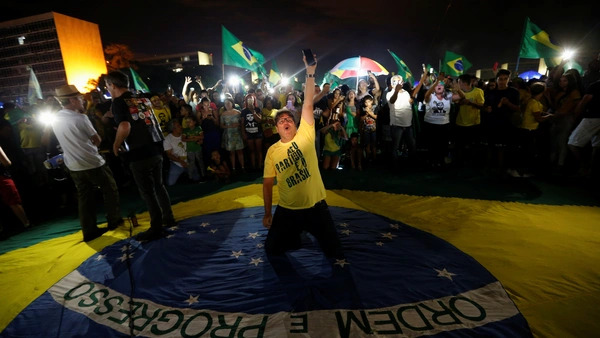 Brazil’s recent election was a marked departure from previous political campaigns in the country. Jair Bolsonaro’s meteoric rise from the far-right fringe to the top of the country’s political establishment is an example of the importance of digital platforms to a successful campaign. Roughly 66 percent of the Brazilian population is online, and about 90 percent of them use WhatsApp, giving any campaign a huge digital audience. Brazil’s digital environment, however, has also created fertile ground for innovative strategies to spread polarizing content with the intent of manipulating public debate. Brazil’s elections have historically been dependent on television. Parties are allotted free time slots based on the size of their party and their representation in the legislature, which TV channels are required to broadcast during campaign period. As a result, large coalitions with many representatives in Congress can allot their television time towards a single candidate, while new parties without a coalition remain with almost no TV time. That is why traditional candidate Geraldo Alckmin, from the Social Democracy Party and former governor of Sao Paulo had almost six minutes of TV time, whereas Bolsonaro, had only eight seconds. Nevertheless, Bolsonaro was elected with 55 percent of the votes in the second round. In order to win, his digital strategy needed to be effective, especially after a 2017 law severely limited campaign donations and forced parties to invest in scalable and cost-efficient strategies. It is worth unpacking what kind of tactics were used in the president-elect’s online campaigning. According to polls conducted a few days before the first round of the presidential elections, 81 percent of Bolsonaro’s supporters reported having used social media, while 61 percent reported using WhatsApp to access information and 40 percent claimed that they use the platform to share information. A poll conducted between the two rounds, showed that 47 percent of the respondents claimed to use WhatsApp to obtain news and information and a staggering 87 percent of them claiming they have received fake news via the platform. Social media companies have been getting better at removing disinformation from their platforms, aided by notice-and-takedown mechanisms and better monitoring. A study from the Oxford Internet Institute found that only 1.2 percent of all Twitter content is polarizing and conspiratorial, what the Institute calls “junk news.” However, concurrent research has indicated that out of the top fifty images circulating in political WhatsApp groups during the presidential election’s first round, only four were real, with the remainder either being distortions of the truth or hoaxes. There are two factors that have made it difficult for Brazil to curb disinformation. First, Brazil’s net neutrality law doesn’t squarely ban the practice of zero-rating, where a telecom operator provides free and unlimited access to certain internet services. The economics of zero-rating incentivize Brazilians to stay within the walled gardens of the services they get for free. If someone skeptical of political content shared on WhatsApp wanted to verify its validity by searching the web, the web search would be counted towards the person’s mobile data cap—effectively forcing them to pay to fact check. Second, the country has been slow to implement its new personal data protection law. The law was passed earlier this year but the relevant regulatory mechanisms haven’t yet been implemented to ensure its full applicability. As a result, users have suffered as their personal information has been bought and sold to subject them to targeted advertisement, including receiving personal and profiled political messages via WhatsApp. These two factors have pushed the distribution of junk news to interpersonal platforms, like WhatsApp, where its creators can abuse end-to-end encryption and the untraceable forwarding mechanisms to promote its dissemination. No one had anticipated how messaging services, that allow for either private messaging or conversations in 256-member groups, could be used to reproduce broadcast mechanisms. Recent research from the Institute for Technology and Society (ITS-Rio) reveals how political groups across WhatsApp overlap, allowing group administrators to coordinate messaging and reach wider audiences. In one case, the same four administrators controlled seventeen different groups. One user was a member of over forty-nine political groups supporting the same candidates. This indicates that WhatsApp groups did not originate from isolated clusters of individuals sharing a common interest, but rather from a small number of individuals promoting and moderating multiple groups. The research further showed that most of the groups had one or two users that presented strong signs of the use of automation, disseminating the same messages and material repeatedly across multiple groups. In other words, automated accounts, also known as bots, were used to catalyze user exposure to political content across the densely connected networks of groups. These broadcast strategies are especially concerning given that law enforcement has no effective means of tackling this issue. Though Brazilian authorities requested WhatsApp limit users’ ability to forward messages, as it has experimented in India, the company claimed that these solutions would be ineffective in the late stages of the election campaign. Furthermore, any technical solution allowing for outside content moderation might hinder WhatsApp’s end-to-end encryption, and trigger a fight over user and communication privacy. The 2018 Brazilian elections show that campaigning in the country has fundamentally changed. TV is no longer the dominant force it used to be as campaigns take advantage of sophisticated strategies that involve open platforms and even interpersonal messaging services. These experiences should be particularly useful for other countries, such as India which also has a large WhatsApp user-base and has elections coming up next year.